So you’re entertaining and want to impress your guests with a variety of delicious food, but can’t figure out what to serve? Try creating a decadent dessert platter in just minutes with these simple dessert platter ideas! 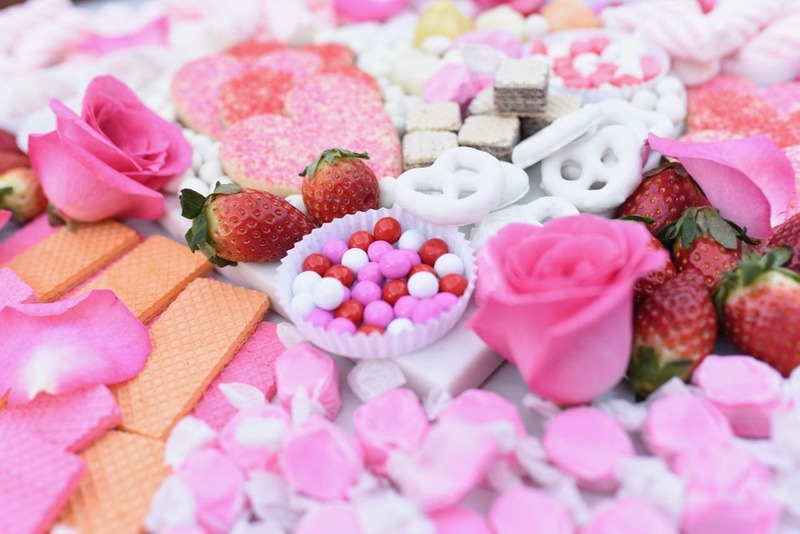 A dessert platter is a wonderful way to serve treats because you can provide a big variety of desserts, so there will always be something that every party guest will be excited about eating. A dessert platter is so simple to put together because you can use store-bought ingredients, so there is very little prep time and no baking required. Can I get an amen?! 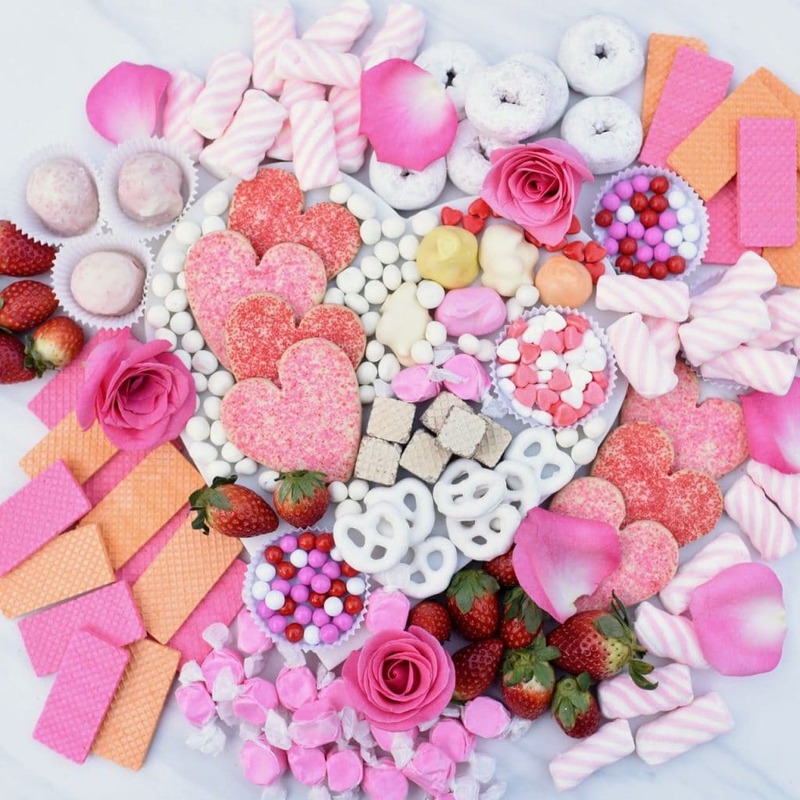 With Valentine’s Day coming up, I came up with some tasty valentine dessert ideas, then incorporated them into a pink, white, and red dessert platter. 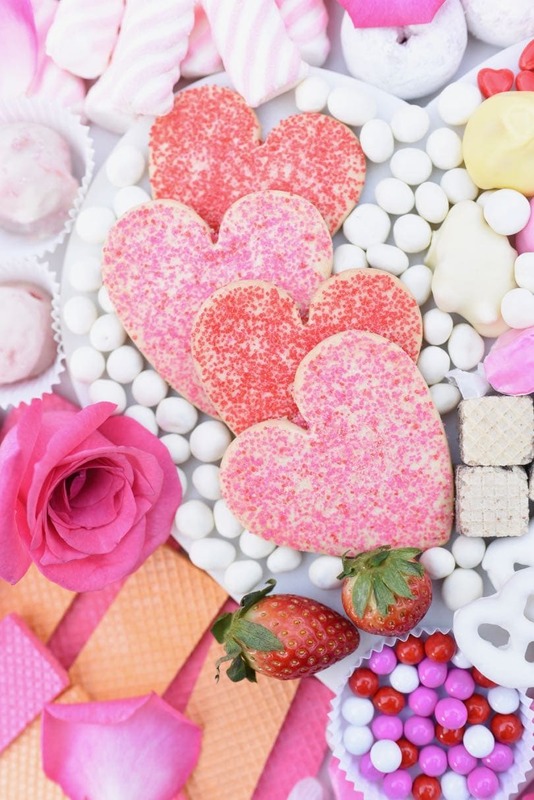 It’s a great way to serve valentines desserts, or desserts for any holiday or occasion. 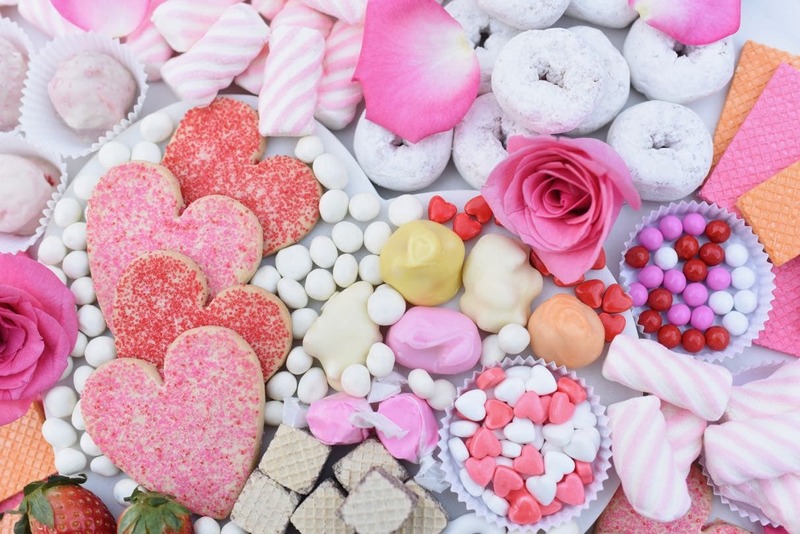 You’ll want to your dessert platter to have a cohesive look to it, so decide on a theme. You can base your theme on a specific holiday, colors (red, white, and blue for the Fourth of July, red and green for Christmas, all pink, etc. ), or even on a specific ingredient (like a chocolate dessert platter or a candy platter). 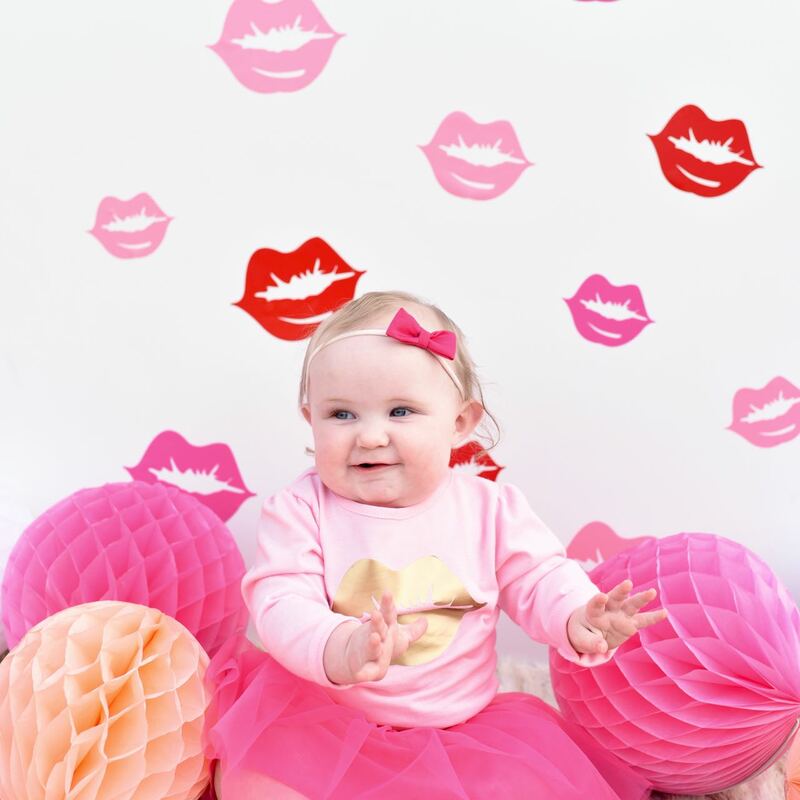 My theme was hearts and pink, white, and red (with a little bit of orange and yellow) for Valentine’s Day. You’ll also need to decide what your dessert platter will sit on. Do you have a long wood charcuterie board you want to use? Or a marble cheese plate? I just bought a gorgeous marble heart platter from Willams Sonoma, so that’s what I used for the base of my platter. Once you choose a theme or have a main idea for your platter, it will be much easier to choose treats to use that look and taste great together. Now for the fun part- it’s time to go shopping! Hit up your favorite stores for desserts, candy, and baked goods that all match your chosen theme colors, holiday, or ingredient. You’ll want a variety of colors, sizes, and textures, so keep that in mind when shopping. You can also add fresh sliced fruit to your dessert board to have some healthy choices in there as well. There are SO many options! You’ll want a nice variety, so buy small amounts of lots of different things so guests can get small tastes of lots of different desserts and treats. Be sure to hit up the bulk bins at your local Sprouts, Smart & Final, or natural foods store so you can buy small amounts of candy and treats without having to pay a lot for big packages of items. 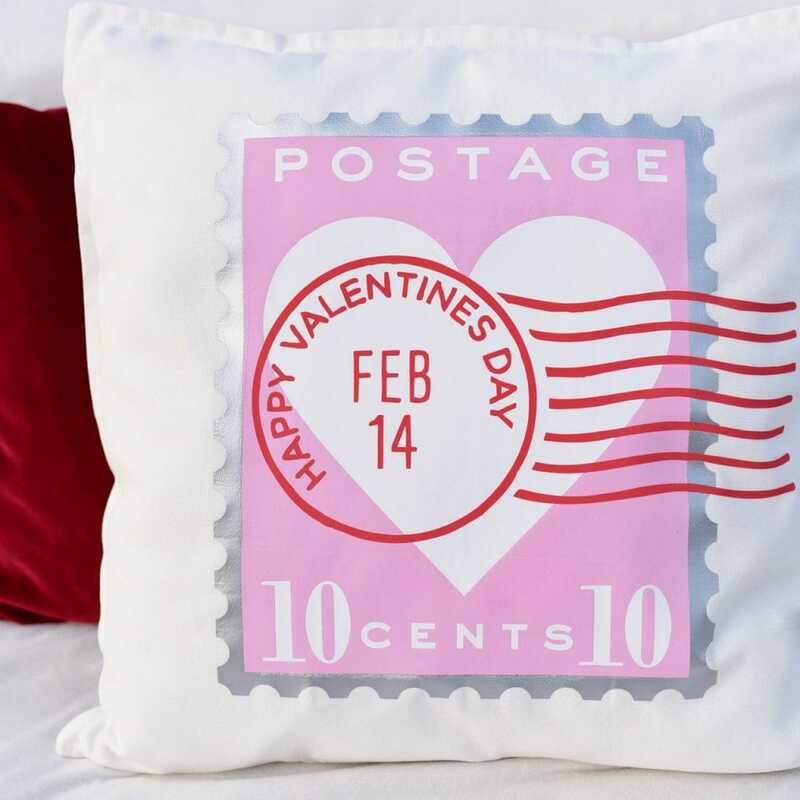 Your local dollar store can also be a great place to start, then you can add in other specialty items (like macarons, more expensive chocolate, fresh flowers, etc) for the wow factor. Start with the larger desserts first. The heart sugar cookies were the biggest on my dessert grazing board, so I placed them down first. 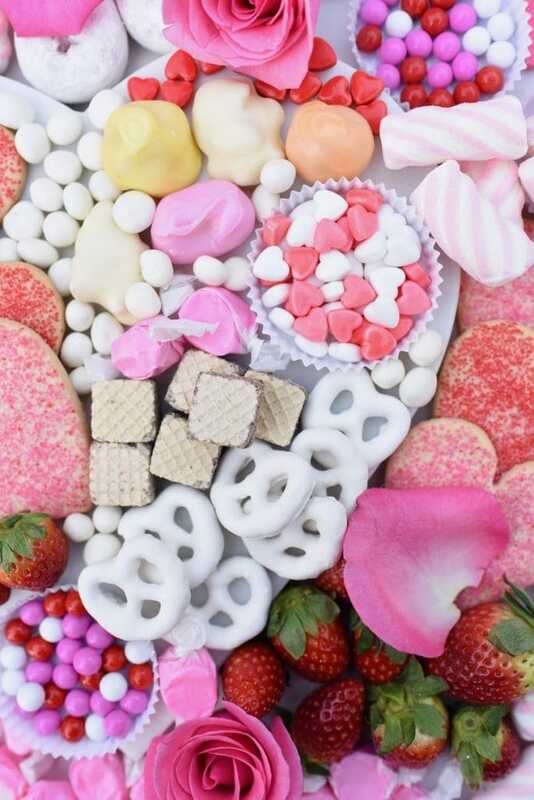 Place small candies and treats inside white paper candy cups so they stay together and don’t roll around the tray. Place like items together. You can have a few different piles of the same items if you’d like, but try to keep things in small piles together so the dessert tray has a cohesive look. Mix up the colors, textures, and sizes. 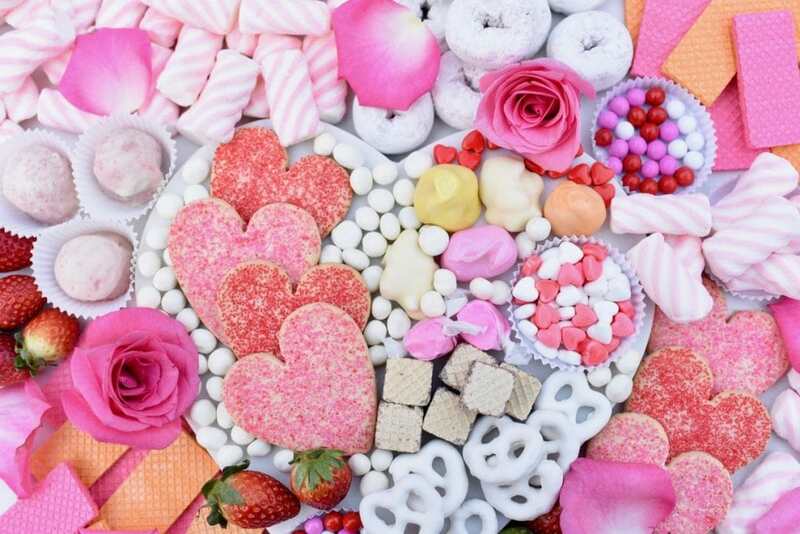 You don’t want all the pink colored candy next to the other pink candy, or all the big desserts on one side, etc. Mix it up so different colors, sizes, and textures and dispersed throughout the tray. 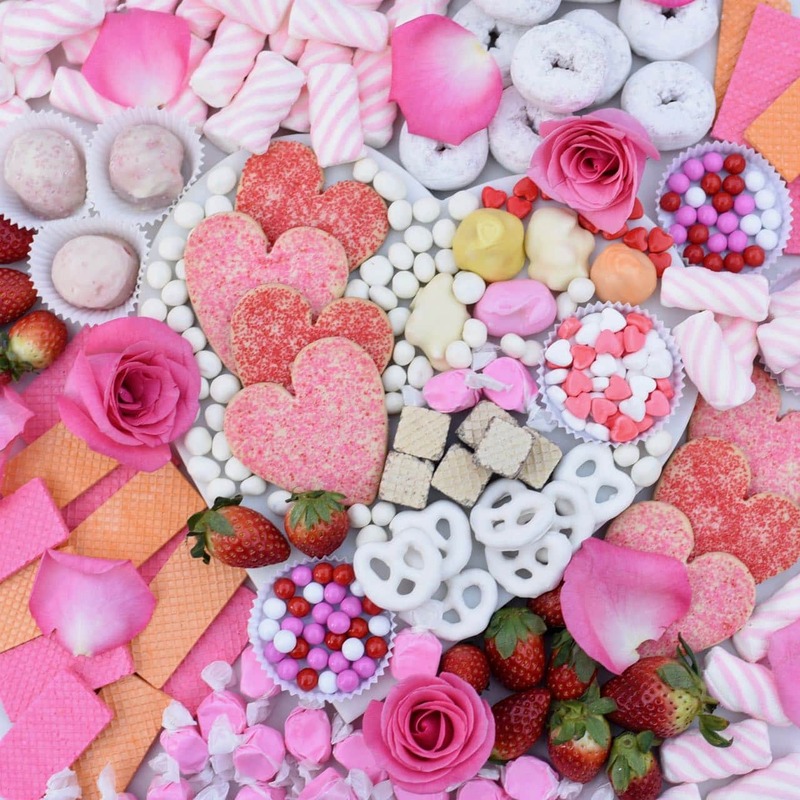 This will make your valentines desserts look more appealing and interesting on the platter. 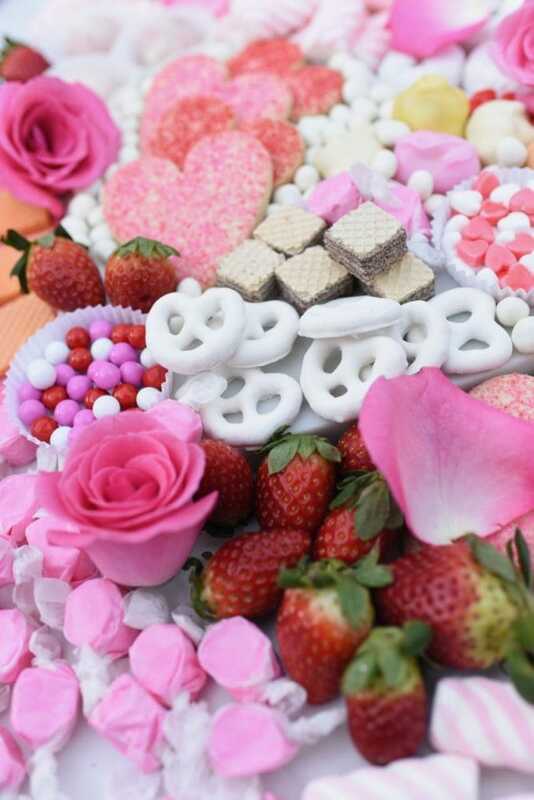 Adding fresh flowers is a wonderful way to add more texture, color, and beauty to your dessert platter. Don’t be afraid to go off the platter. 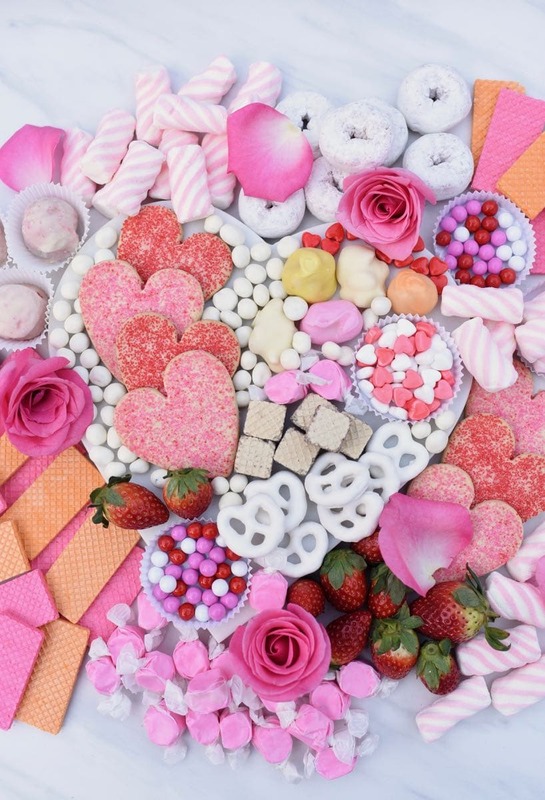 My marble heart platter was way too small for all the desserts I bought, so I scattered more off of the heart platter. I love how it looks! My valentines desserts platter still looks great and full, and now it will feed even more people too! When its party time, set out the dessert platter in a central location. Be sure to provide small plates, napkins, drinks, and utensils, and let the guests serve themselves. If you have a large platter and leftovers at the end of the party, you can also give guests small clear bags and some ribbon so they can bring some treats home with them. It’s a great way to thank them for coming and a fun party favor to bring home. A dessert platter is a simple, yet elegant and trendy way to serve desserts for birthdays, baby showers, graduations, anniversaries, weddings and receptions, or for holiday parties. Just scale your dessert tray up or down depending on your party size and how many guests you’ll be serving, and you’ll be sure to have a room full of smiles!